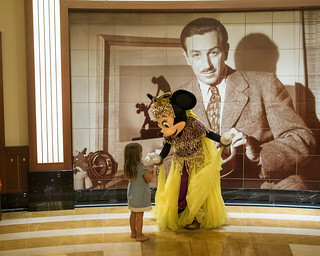 Minnie Mouse meets one of her many adoring fans outside the Walt Disney Theater aboard the Disney Fantasy. The performance that night was a production of "Aladdin," so I'm sure Minnie chose her outfit to get into the spirit of the show. This was the one show we missed during the cruise (because we had dinner at Remy that night -- Yum! ), but Sam said it was very well done.